"He's someone to ride the river with." (Louis L'Amour). On a 10 day wilderness hunt you get to know someone very well. It is extremely difficult to find someone with the same passion, enthusiasm and drive who won't hold you back in the mountains. As far as hunting abilities and attitudes go for us, it was like we were cut from the same cloth. Perhaps separated at birth? We make each other better hunters and because we share the same love for Jesus, we make each other better men; as iron sharpens iron. Every man should have a relationship like this. When we're in the woods there's a mighty good chance some kind of animal is coming out with us. 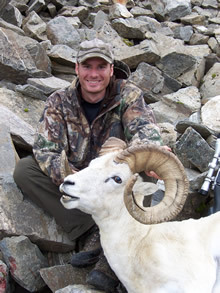 The Grand Slam of North American Wild Sheep and the various other world "slams" certainly have their place in sheep hunting lore. But these types of pursuits are out of the realm of average hunters, ourselves included. 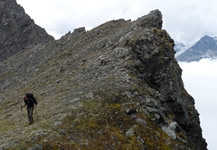 The Alaska Slam, taking a ram from the seven mountain ranges in Alaska that hold sheep (Wrangell, Chugach, Brooks, Alaska, Talkeetna, Kenai and Tanana Hills/White Mountain Ranges) is a realistic, obtainable goal for dedicated Alaskan hunters. It represents years of commitment and hard work. 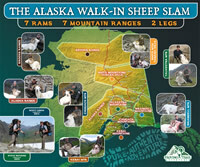 We've taken that goal to the next level – to take a ram from these seven mountain ranges all on walk-in hunts. No bush planes, ATV's, boats, or other mechanized transport other than a pick-up truck to get us to the trailhead. To our knowledge, it hasn't been done before. We've changed that. 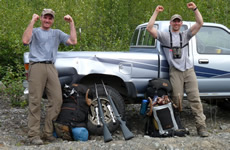 Our videos contain some of these hunts as well as many of our other backpack style hunting trips that separate us from the typical hunt video on the market. 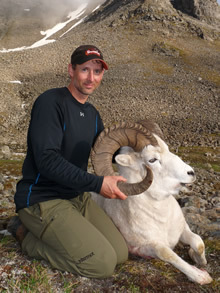 Check out the Proving Trail Blog for updates on this unique sheep hunting challenge.